Women love to use setting powder in order to control shine and hide any blemishes or smaller imperfections throughout their day. When shopping for your ideal powder, make sure you are well aware of your skin texture and your preference before investing some money. In order to find the right setting powder for you, we will teach you some basic rules and then how to use setting powder like a pro. There are two different types of powders, such as loose or compact. Both of these powders have fine particles that can and will set your entire face in place. You can use these after you are done applying your liquid foundation. Usually, loose powders are a lot more lightweight and easy to pack onto the skin. However, compact powders are usually a bit more appropriate for touch-ups, and for taking carrying outside the house. Compact powder is a lot denser, which makes it easy to work with if you are in a hurry, or when outside. Usually, translucent powders are great at minimizing shine and taming down your oils. Also, women who are struggling with finding their perfect powder shade should stick with translucent powders because they have no color, and can easily adapt to your natural skin shade. 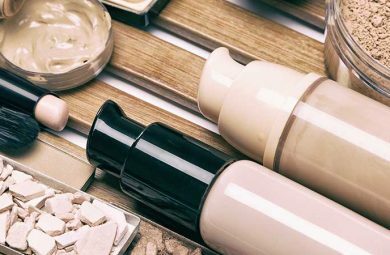 These powders usually work well with both normal and dry skin types, and they can be applied with a beauty blender, a puff, or your favorite face or powder brush. These powders can further enhance your already built-up coverage and are ideal if you need long-lasting makeup. You can carry them with you to re-touch your makeup, but also to set everything in place and make it seamless and quite matte. Most of the times, compact powders usually suit women who need a lot of coverage, and those who have a lot of oils. This powder is usually applied with a large powder brush, but not with a beauty blender. Prime your face no matter your skin type. Make sure your face is cleansed and moisturized before proceeding further. Once it is, reach for either a mattifying primer (if your skin is oily), or for a silky and hydration boosting one (if your skin is dry). Apply your primer by rubbing it into the skin by making circular motions. Let it sink in and proceed further. Apply your daily go-to foundation with your fingers, a sponge, or with a brush. You can even use a tinted moisturizer if you prefer minimal coverage, or even a high coverage foundation – this is totally up to you and your preference. Make sure that everything is blended into the skin and that it looks seamless before reaching for your powder. Makeup tip: You can always set your face with powder, doesn’t matter if the base underneath is minimal or full coverage. 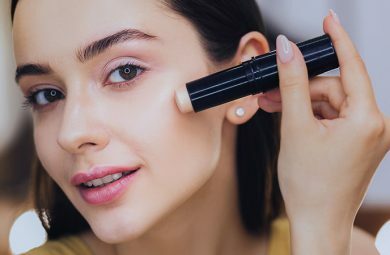 However, never apply powder to clean skin which has no makeup on, since this will dry it out, and leave with some minimal and poor looking coverage. Compact setting powder. If you are going to use a compact powder, make sure you pick a generous amount of it with your fluffy powder brush. Dab the brush into the powder and apply it all over your face by making tapping motions. Never rub or swipe, since this will take away your wanted coverage. Translucent setting powder. 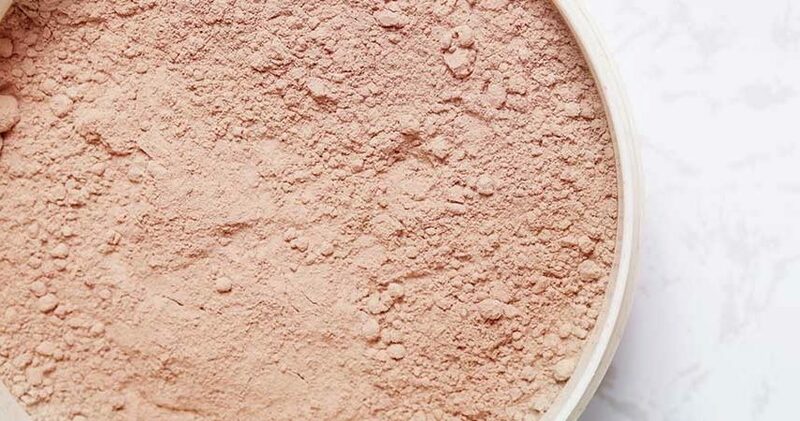 If you choose to set your face with translucent powder make sure you shake out a generous amount of the powder into the lid of its packaging. 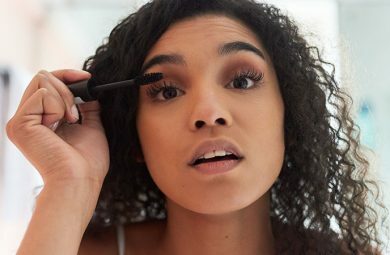 Use either a beauty blender, your brush, or even the small puff that often comes with the powder to set your foundation. As previously mentioned, dab the product into the skin and don’t swipe. If you are someone who has super oily skin focus the product mostly on your so-called t-zone (forehead, nose, and chin area). Here, your oils tend to shine the most, which is why you should layer a bit more of powder on top. As you do just make sure you stay away from your hairline, you don’t want to get a lot of the product onto your hair since it can be a bit difficult to wash it out, or even clean with a wet wipe. Lastly, you can bake your skin if you want full coverage and if you demand longevity. Use your brush and apply an excessive amount to the under eyes, your chin, and underneath your cheekbones. Let the product sit on top for five minutes before you dust it off with a large brush. Finish off your look by following with some bronzer, contour, blush, or highlighter. Makeup tip: Only use powder products at this point. 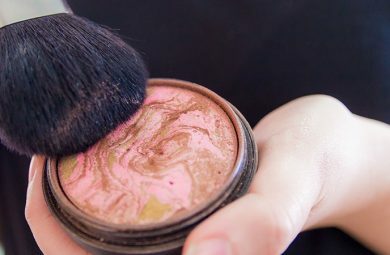 If you have liquid bronzers, contours, blushers, or highlighters, use them before applying your translucent or compact powders.